Add an outboard motor bracket easily and safely to the swim step of your boat. Designed for maximum 9.9 HP high-thrust four stroke outboard motors for mounting on a swim step. Constructed of marine grade aluminum alloy and powder coated white for corrosion protection. 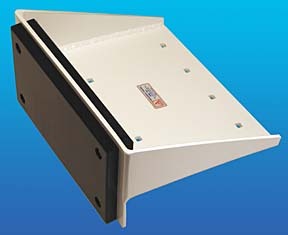 Mounting pads of polypropylene, fasteners of stainless steel. Maximum 9.9 HP high-thrust four stroke motor. Maximum 140 lbs. 12 1/2” wide by 11 1/2” deep. 7” high, 4 1/2” above swim step. Shipping weight 11 lb. 8 oz. Get it with Reinforcement Plates - Model 10000REP for added support for just $45 more.